Imagine being able to sit down and hear such New Testament characters as Aristarchus, Barnabas, Timothy and Luke tell their own stories! The author thinks about what this might have been like, encouraging us in these thought-provoking reflections to go back to the biblical record and see for ourselves what was said and done. KEN WALTERS preaches at St Michael's Church, Aberystwyth. He is a Distinguished Research Professor in the Institute of Mathematics and Physics at Aberystwyth University. His many academic and professional distinctions include his election as a Fellow of the Royal Society in 1991 and as a Foreign Associate of the National Academy of Engineering of the United States in 1995. He holds a DSc degree of the University of Wales and honorary doctorates at the Université Joseph Fourier, Grenoble, France, and the University of Strathclyde, Glasgow, Scotland. In 2010, Professor Walters accepted an invitation to become one of the Founding Fellows of the Learned Society of Wales. 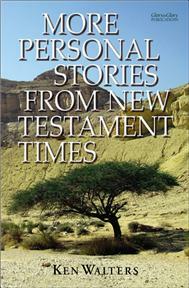 More Personal Stories from New Testament Timesis Professor Walters' second Christian book. It may be seen as a sequel to The Way it Was, published in 2003. This book is intended for a general Christian readership. It could be well be used as a discussion starter resource for small groups. This book would be useful for a Lent course/group bible studies. To help with this the author has provided some simple study material in the form of discussion questions.